My husband always discounts Valentine's Day as "another one of those Hallmark holidays", but I disagree. Valentine's Day officially dates back to 496 AD when Pope Gelasius proclaimed February 14 to be a feast day in honor of St. Valentine, a Roman martyr of the third century. The Christian feast was to replace the pagan Roman feast of Lupercalia, a fertility celebration observed annually on February 15. There are many versions of the story of St. Valentine, but most agree that he was a bishop of the early church who held secret marriage ceremonies for Roman soliders who wished to marry after the Emporer Claudius II declared it to be illegal. 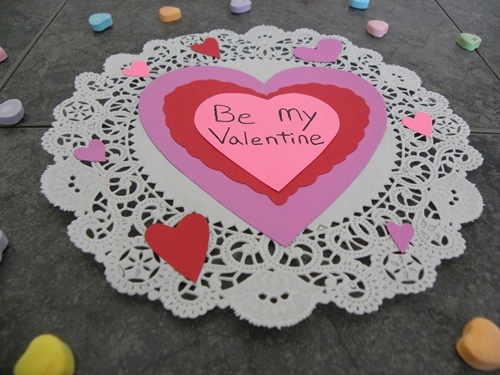 (History of Valentine's Day) So actually, Valentine's Day is one of the oldest holidays -- long pre-dating greeting cards. As a child, I loved Valentine's Day. My mom always made it special. She would make special, decorated sugar cookies and buy us beautiful red foil, heart-shaped boxes of Sander's chocolates. We would usually get a small gift. For example, I can remember my sister and I each getting a sterling silver charm for our charm bracelets one year. 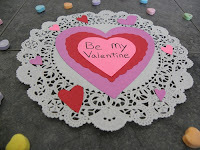 We would get out construction paper, doilies, glue, and crayons and make beautiful Valentines. Plus, there was always the fun of going to the store and choosing Valentines for classmates, making special Valentine "mailboxes" to hold all our cards, and Valentine's Day parties at school. Perhaps you can see why Valentine's Day holds a special place in my heart. I have tried to preserve some of these special traditions with my own children over the years. Even though they are adults now, I still make sure they at least get a special Valentine card and a little gift to celebrate. Adding to my Valentine's traditions, this year I did complete a couple of new pieces of jewelry in honor of Valentine's Day for my ArtFire shop -- my Hand-Embroidered and Beaded Heart Earrings and a Whimsical Hand-Felted Beaded Heart Pendant. And on another Valentine's Day note, the ArtFire of Michigan Guild (of which I am a member) is adding to the holiday festivities by sponsoring a Valentine's Day Giveaway Contest! Many members of the Guild are donating wonderful items they've created. I contributed my Colors of the Heart Bracelet. The winner of the Giveaway receives the ENTIRE collection of donated items! The Giveaway runs from January 29th through February 4th, so be sure to visit the ArtFire of Michigan Guild Blog and enter for a chance to win! I know Valentine's Day is still two weeks away, but getting ready for it is the best part. Happy planning and Happy Valentine's Day!